Scotland have announced that fullback Hugo Southwell will sit out the forthcoming World Cup by mutual consent. The 31-year-old full-back had been battling to recover from a knee injury in time for the tournament, which takes place in September and October in New Zealand, with Scotland opening their campaign on September 10 against Romania. Although the Stade Francais player is hopeful of returning to fitness ahead of that date, an early decision has been taken to withdraw him from contention. "He took it really well, he was fine with it, " Robinson told BBC Scotland. "When you add it all up, it was a decision that he and I both agreed was right. You're always talking to players about where they are and the progress they are making. "Hugo is making sound progress but we just felt that, where we are as a squad, and where he is, it was right that we came to the decision, rugby-wise, that he wasn't going to be part of the squad." News of the omission was earlier confirmed by Robinson on the Scottish Rugby Union's website, where he said: "After talking this through with Hugo we've taken the decision to stand him down from our Rugby World Cup squad by mutual consent. "Hugo has been working hard to recover from a knee injury but has not been able to take a full part in our training camp and while he may be fit to resume playing in mid-to-late August, both Hugo and I have decided that he will not be part of our World Cup plans. Hugo has been very diligent in his rehabilitation programme and I'm sure he will be determined to perform for Scotland again in the future." 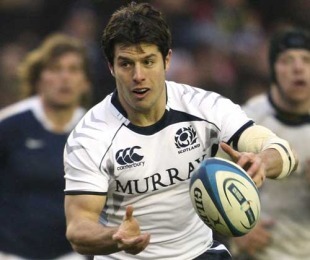 Southwell, who played five games in the 2007 tournament in France, will not be replaced in Scotland's squad, leaving Robinson with 38 players to work with. The coach will announce his final 30-man party on Monday, August 22. Asked if he already has his squad in mind, Robinson said: "We've got two matches [coming up] and in those two matches the players are not just playing to be in the 30 - they are playing to be in the starting XV for the game against Romania. "We want the guys to go out there and represent Scotland and play at their very best, albeit they're in full training at the moment and we're not looking at them to peak. We are looking at them to be able to play through these first two friendly matches that we have."